Baron's Haugh Godwit bonanza thanks to loads of mud! RSPB Scotland Baron’s Haugh has proven to be a brilliantly successful spot for waders this year, with black-tailed godwits reaching their highest recorded number for the reserve since 2003. This year, there have been 49 spotted, with 26 being the previous record. 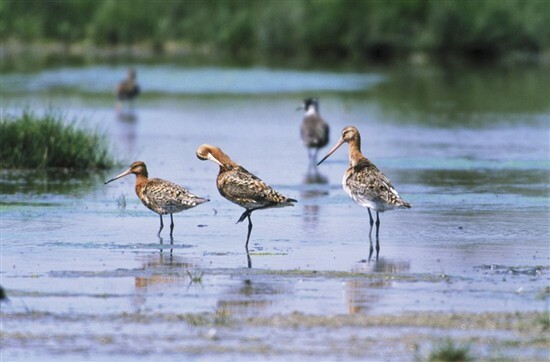 Black-tailed godwits are a rare breeding bird in the UK and currently sit on the RSPB red list for conservation priority, the highest level on this list, making them a species requiring urgent conservation action. They can be recognised by their long beaks and legs, and the black and white stripes on their wings. In the summer, they have bright orangey-brown chests and bellies. However, they will currently be moulting into their duller, greyish-brown winter coats. Baron’s Haugh has also been enjoying an unusually high number of green sandpiper sightings (another wading bird), with their record this year reaching 14. This species is on the amber conservation priority list, the second-highest level. 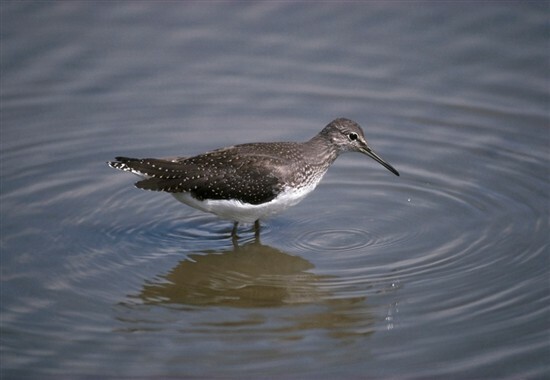 Green sandpipers are distinctive for their dark upperparts, pale underparts and white rump. They too have the typical long bill and legs of waders, although they are much smaller than black-tailed godwits. In addition to this, a redshank has been spotted on site as well six common sandpipers and plenty of lapwings, which often appear in good numbers at Baron’s Haugh, with their peak season coming up this October. Later in the season, whooper swans will start arriving, travelling down from their usual Icelandic residence, as well as wigeons and tufted ducks swooping in for a winter stay. The reason for an increase in wader numbers at the reserve this year may be down to tweaks to water management on site. Wardens at Baron’s Haugh have manipulated the water level of the wetland by opening up the sluice, which dispenses more water into the nearby River Clyde. Reducing water levels in the wetland at this time of year means there’s a larger area of exposed wet mud available for visiting waders to probe in search of juicy aquatic invertebrate snacks. There’s also a possibility grazing cattle has helped by eating back marginal vegetation and creating more habitats for visiting birds to rest and feed. For visiting birdwatchers hoping to catch a glimpse of these birds, you’re in luck! Large numbers of birds are easily visible from the reserve’s hides, with green sandpipers even coming right up the channel alongside the Marsh Hide. Reserve wardens carry out a wide range of management tasks so they’re always asking for visitors to pass on their own sightings, so if you’re there and count an even higher number of waders, feel free to approach staff on site, or send an email to barons.haugh@rspb.org.uk along with any pictures you may have snapped. You can also tweet @RSPBGlasgow. If you’re wanting to get involved in a more hands on way, RSPB Baron’s Haugh always needs new volunteers to join the team; for further details email barons.haugh@rspb.org.uk. Finally, if you’re keen to help out but just don’t have the spare time, you could become a member of the RSPB. Your support will help maintain our reserves and create a home for all our visiting wildlife. Contact reserve staff for more information.